Windows 7 & 8 Taskbar Enhancements… Some you know… Some you probably don’t. Most people who have used Windows 7 and 8 long enough accidentally stumble upon some of the more useful features in Windows 7 & 8. One is the convenient enhanced taskbar where you can hover over program icons and see a small graphic thumbnail of the actual application window without opening it. 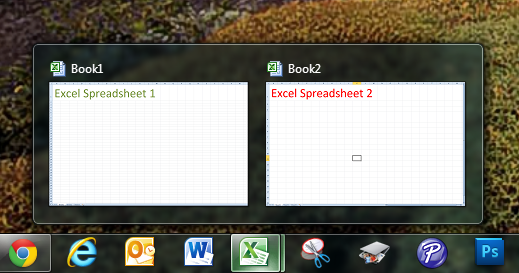 The graphic below shows the result of hovering over the excel icon which currently has two spreadsheets open. Pressing Shift before clicking on the icon opens up a new instance, even if existing windows are open. Holding Shift+Ctrl does the same, except it opens the new instance with administrator permissions! Holding Ctrl before clicking an icon will open the window instance that you most recently used in a group of open windows. Discovering Windows features and shortcuts can make you more productive and make your time in front of your PC a little more fun! Enjoy!